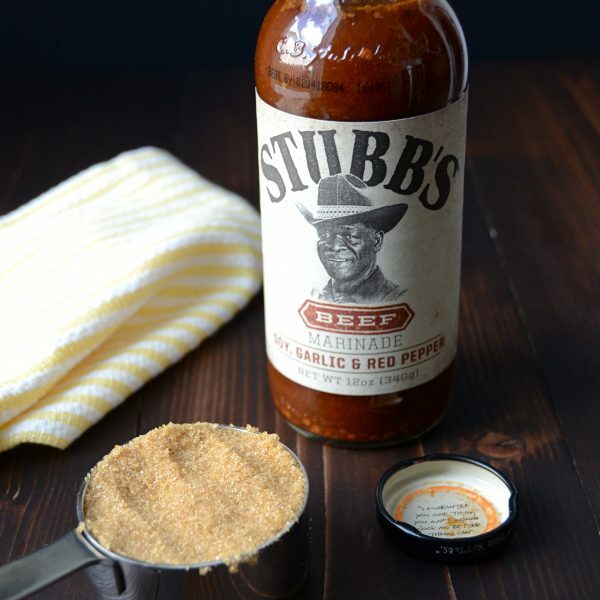 Soy, Garlic and Red Pepper Beef Marinade by Stubb’s Legendary Bar-B-Q! This sauce is smoky, with some cumin notes and a little heat at the end. Perfect for babying these bone-in rib-eyes. I added a little brown sugar for a hint of sweetness and that was it! We’ve used Stubb’s Original Bar-B-Q sauce for chicken and ribs before, but this was my first experience with their marinade. Wow! I normally make my own marinades, but when I find a product that delivers the flavor I want and time savings, too — I’m all for it! And Stubb’s uses natural ingredients, like I would. No high fructose corn syrup here. That’s actually one of the reasons I decided to work with Stubb’s. All of their sauces, rubs and marinades are made from real ingredients, with no artificial flavors, colors, or preservatives. And they’re gluten-free. The marinade I used here was their Beef Marinade — though I think it would work well with pork and chicken too. Heck, I even used it on the vegetables! The combination of those smoky marinated steaks with the grilled pineapple and vegetables was sublime! And it was so simple, that I felt guilty calling it a “recipe”. Of course, it’s the steak that’s the real draw here. These gorgeous rib-eyes (about 1″ thick) swam around in the marinade for several hours before hitting the grill. The longer the soak, the more of that great marinade flavor comes through. Toss the green onions on the grill during the last five minutes or so of grilling the steaks — and definitely brush them with some of that killer sauce! You should have seen the vultures flying while I was taking pictures (and by vultures — I mean Scott and Emily) . Try it with grilled chipotle-lime corn, black-eyed pea salad or rosemary-mustard potatoes. Your diners will love it! Thank you for supporting the brands that support Garlic + Zest! Tender marinated rib-eye steaks with pineapple and peppers make this grilled dinner a complete meal for summer! 1/2 large red onion cut into 1" pieces, separated. ALL of Stubbs products are great! I especially love their chicken marinade and original bbq sauce. Stubbs was the last place I ate when I left Austin 20 years ago. I agree – they’ve got really great bbq sauces, rubs and marinades. Didn’t know they had a restaurant location too! Wow! how can I print the recipe without the Nutrition box? It’s kind of an all or nothing Bonnie. I checked with the producer of my recipe plugin and they could give me code to disable it, but it would disable across the board and no-one would have that option. Let’s see where this goes… If there’s a huge outcry that everyone hates the nutrition label, I’ll hire someone to do the CSS code – cause I’m not touching that…. LOL! What a beautifully done recipe and group of pictures. Maybe we will do this for dinner tomorrow!